Standard Tech offers turnkey system solutions for the curing of raw hams. In addition to building these systems, the company also offers clients expert technological support intended to combine curing technologies with product processing stages. 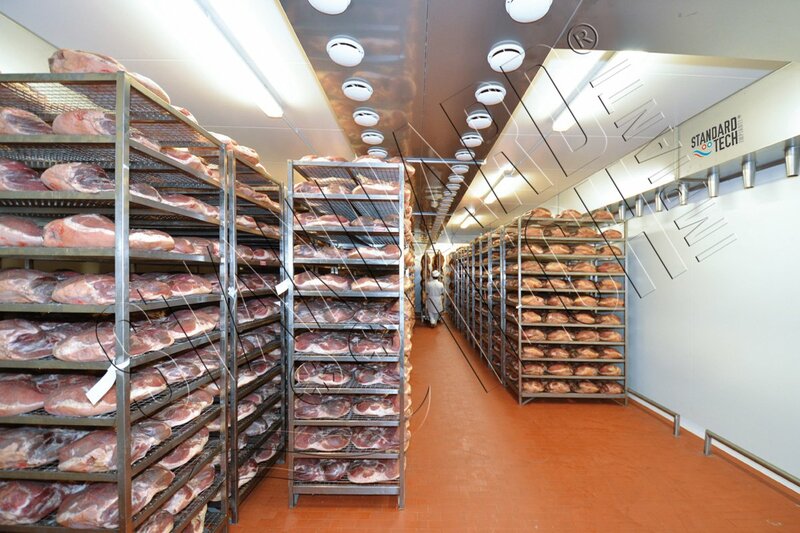 The duration of the process varies from 2 to 3 weeks based on the weight of the piece processed, in order to allow for the correct salting of the meats with consequent absorption of sodium chloride; these rooms guarantee the correct temperature and humidity values with prevalently static systems and heat ventilation cabinets. The construction materials are naturally non-oxidizable in order to guarantee the system’s longevity. These systems are equipped with stainless steel air treatment handling units with prevalently autonomous Ecofreddo® refrigeration plants with high energy savings, to supply cold and heat in the coils simultaneously without the aid of further secondary systems. The coils are built with unique geometries in order to reduce the number of defrosting procedures to the minimum, and therefore guarantee the weight loss and gradual dehydration necessary for these important cold-drying processes. Once again, the controlled parameters are temperature and relative humidity, the latter being particularly low, combined with air distribution with internal ducts in stainless steel sheets, air supply cones and programmable recovery anemostats in non-oxidizable material. The air ducts are also sized so as to guarantee a continuously moving blade so that each individual piece of ham is treated with the same thermohygrometric conditions, avoiding non-uniformity and risk of encrustation. A fundamental part of the system is the control switchboard with a PLC; it allows the completely customised management of the pre-curing and curing parameters, and lastly, the configuration of operating/down-time periods with different time frames or intermediary down-time positions. Naturally, the switchboard complete with the Control-Tech 3000® supervision system can also be managed and monitored remotely. Based on ham processing technology, STANDARD TECH offers drying rooms with turbo systems that can be managed with PLCs. This operating process with higher temperatures compared to those described previously and with a duration no longer than 15 days, allows to start the subsequent ripening phases through the activation of the enzymatic catalysis. The systems for pre-aging (first period with a maximum duration no longer than 3 months) and aging (until the correct level of product maturity and aroma has been reached) rooms are made with high-technological units. These phases, which see the highest temperatures at play, also include the use of enthalpic free-cooling systems that use external air without aid from refrigeration plants, with notable energy savings. STANDARD TECH also combines the raw hams curing process systems with refrigerator rooms for the receipt of raw materials, high-technology Clear clima® air conditioning systems for deboning rooms and Steril-tech® clean rooms in the possible presence of ready-sliced ham product.